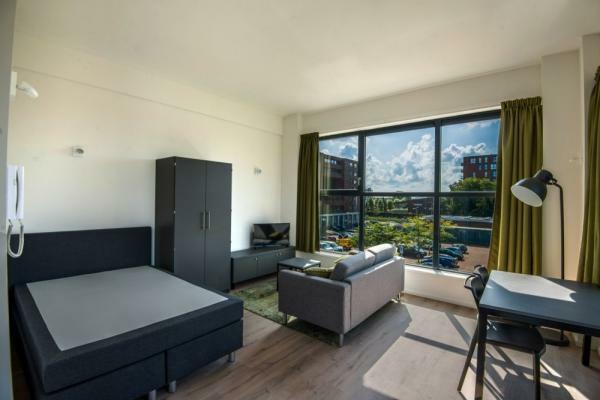 Beautiful particular fully furnished studio apartment in the middle of the city centre next to the 'Plein' and central station. Lay out: Own entrance on the ground floor, stairs to the 1st floor where is the spacious area with lots of light and a charming fir place (fake). The kitchen is open and has a fridge, sink, coffee machine and gas stove, Through the kitchen to the spacious and sunny terrace. The bathroom has a shower, sink and wash/dry combination, separate toilet next to the bathroom. The sleeping side is at the front side and has a double bed. The studio is equipped with under floor heating. parking permit available through municipality.